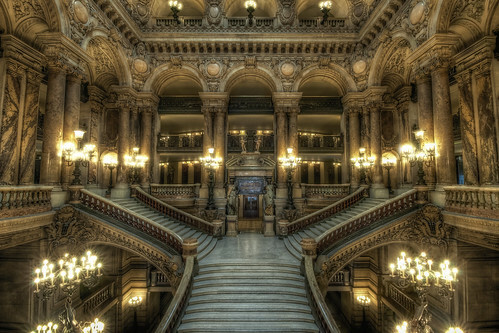 Universal Studios recreated the grand staircase from the Paris Opera House for the masquerade ball sequence in The Phantom of the Opera. The sequence was filmed in an early version of Technicolor and features the Phantom (Lon Chaney Sr.) as The Masque of The Red Death from the Edgar Allan Poe short story. Universal's set was extremely accurate when compared with the original, which was made in white marble with red and green balustrades.